H&M tasked us to help develop a marketing idea that celebrated their collaboration with Versace. 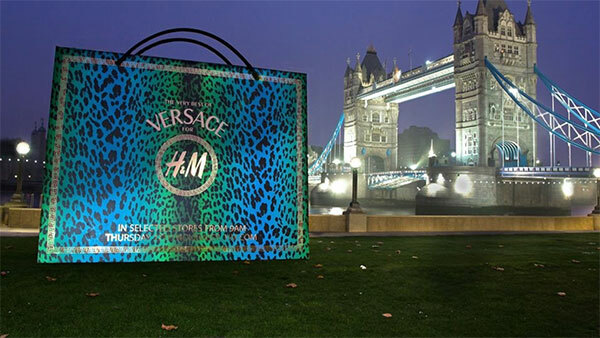 We designed and produced giant branded bags, printed with high-impact graphics and positioned them overnight over three days in a PR stunt across seven iconic London locations including Tower Bridge, Westfield, Covent Garden, Trafalgar Square and Regent St. The idea was that each bag would provide an excellent photo opportunity for people to share and become a talking point on social media. The overnight movement added an element of surprise and buzz around the stunt. It was so successful that it was used again for the launch of the H&M David Beckham range of underwear.